Aloe ferox is most well-known for its medicinal properties. 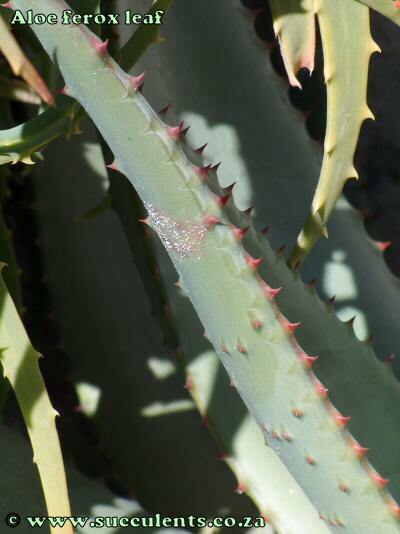 The sap is used as a purgative and is commonly called bitter aloes and it has been in use for the past 200 years. Aloe ferox can be confused with Aloe marlothii especially specimens from KwaZulu-Natal (formerly classified as Aloe spectabilis). The Aloe marlothii plants from KwaZulu-Natal have racemes that are slightly angled and their leaves have spines present which is usually lacking in Aloe ferox species found in KwaZulu-Natal. The specie name 'ferox' means 'ferocious' and it refers to the spiny leaves. Aloe ferox has been granted tree status and it's national tree number in South Africa is 29.2. Common Names: 'Bitteraalwyn' or 'Bitter Aloe' when translated, the common name refers to the taste of the sap that is used as a purgative. Tap Aloe, Cape Aloe. Status: Not threatened but some populations at risk of becoming extinct due to overexploitation and unsound harvesting methods. Distribution: Found from Swellendam in the in the west to into the Eastern Cape and KwaZulu-Natal as well as southern Lesotho and the southern parts of the Orange Free State. 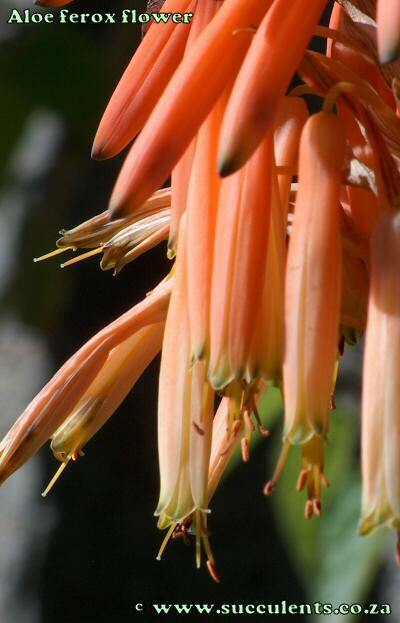 Aloe ferox can be found in a variety of habitats, from rocky areas, slopes and open places. 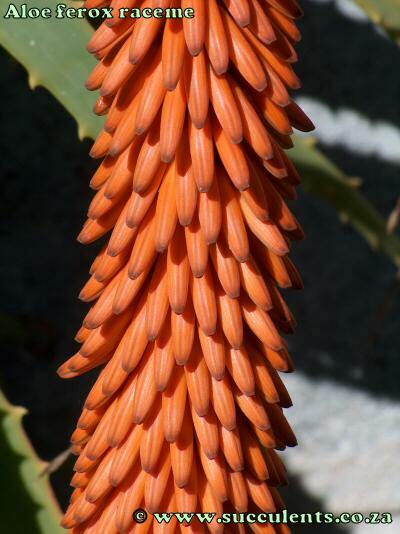 Stem: Aloe ferox can reach a height of up to 5 meters in mature specimens but it is usually only 2 meters on average. Dry leaves are persistent on the stem. Leaves: Leaves are broad, they vary in colour from a dull green to a greyish green colour, the leaves will turn a reddish colour if the plant is under drought stress. dark brown spines are present on the leaf surfaces, more so the lower leaf surface, the leaf margins are armed with numerous sharp teeth that are a red-brown colour. Inflorescence: The complex inflorescence is branched into 5 to 12 racemes. The raceme is tightly packed with numerous flowers. Flower: Flowers are orange-red, yellowish or white in colour. Flowers are tubular in shape with the style and stamens protruding from the mouth of te flower. Flowering Time: Flowering usually occurs in the winter months of May and June but plants found in colder areas usually flower in September and November. 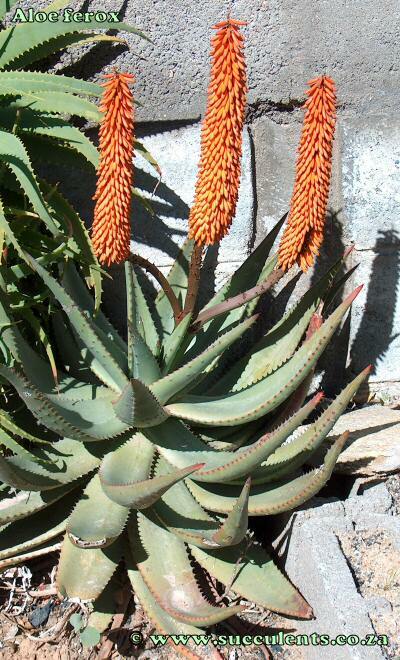 The best form for garden cultivation is the Natal form previoulsy classified as Aloe candelabrum. Aloe ferox should be grown in soil that is well drained to help prevent rot. Picture: Aloe ferox in flower in cultivation.